Commentary by Capt. Frederick Way Jr.
12 1/4 x 18 1/4 inches. Original oil painting of the GENERAL WOOD created by William E. Reed in 1968. It was commissioned by S. Durward Hoag and is exhibited at the Lafayette Hotel in Marietta, Ohio. Caption below is by Capt. 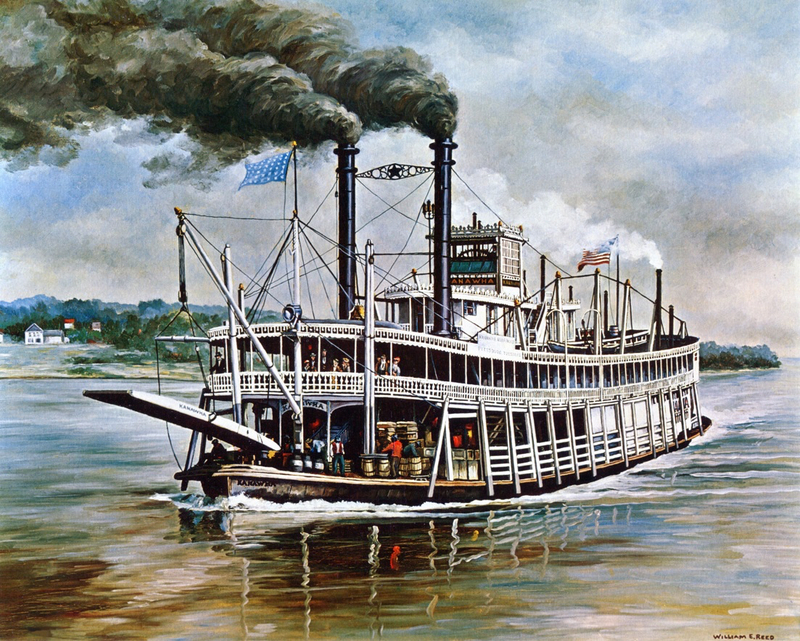 Fred Way Jr.
"A number of popular packets came to the Upper Ohio from the Lower Mississippi, among them the SENATOR CORDILL, BETSY ANN and the S. L. ELAM. This latter boat was promptly renamed GENERAL WOOD when she arrived in 1918. 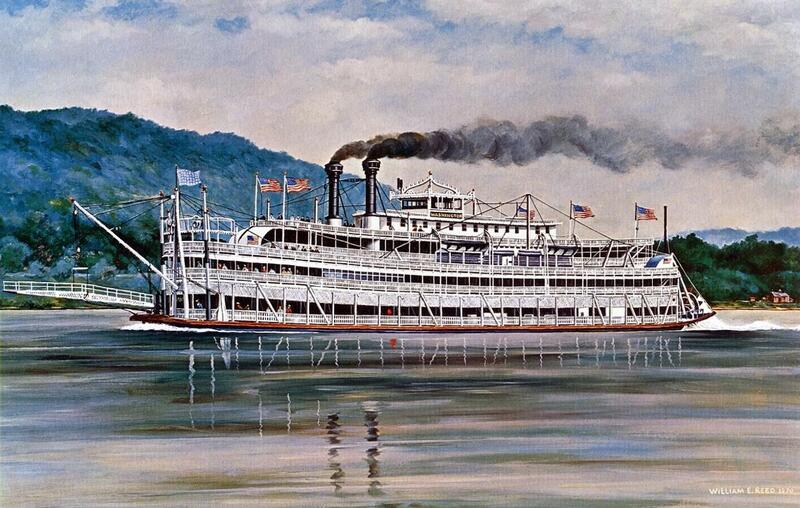 She had been bought by the Liberty Transit Co., Wheeling, West Virginia organized to revive river traffic. All four of the company boats were named for World War II generals. The WOOD was placed in the Pittsburgh-Cincinnati trade admired by many for her graceful hull lines and sweep of decks. Anyone who ever heard her deep vibrant whistle is not apt to forget it. She became a victim of the Depression Years and did her last running about 1931." Original oil owned by Sons and Daughters of Pioneer Rivermen and displayed at Campus Martius Museum, Marietta. This great side-wheel packet plying between Cincinnati and New Orleans, built in 1878, was named for the Star and Bethlehem. She was owned by Capt. William Bainbridge Miller, native of Austinburg, Ohio. This skipper differed from the majority of his contemporaries in that he was a graduate of Grand River Institute, versed in Greek and Latin. He lost his boat in 1881 not from violence of snag or fire, but through the mundane humiliation of failing to meet his obligations. A U.S. Marshal sold her to Capt. J. D. Hegler of Cincinnati who continued operating her until she was lost in ice in 1893. The large roof bell seen on the forward end of the skylight (it weighed 1800 pounds) later served on the HOMER SMITH, depicted as one of this series. The steamboat above is the TARASCON, and that is a pretty name, French, and the Tarascon family built sailing ships at Pittsburgh starting in 1801. Soon after that they were making flour, and had a rope-walk and other interesting affairs at the foot of the Louisville Falls. The Tarascon Mill was a landmark at Shippingport for years after. William E. Reed painted this picture just a month ago for Bert Fenn. The TARASCON was built in 1895 at the Howard Ship Yard and for about twenty years ran in the packet trade between Louisville and Evansville. That's why Bert Fenn cherishes the boat; he remembers seeing her at Tell City, Indiana. Bill Reed was generous to allow us to reproduce this, and Bert Fenn even more so. While we messed around three weeks getting this color picture made, Bert was biting his fingernails, maybe not literally, for he hadn't yet seen the original oil. So this is a special Christmas present to all S&D members particularly from Bill Reed and Bert Fenn. They join with S&D's editor and wife, and with the S&D officers, in wishing each and all a steamboat-load of joy delivered aboard the Str. TARASCON waiving the usual bill of lading exceptions. 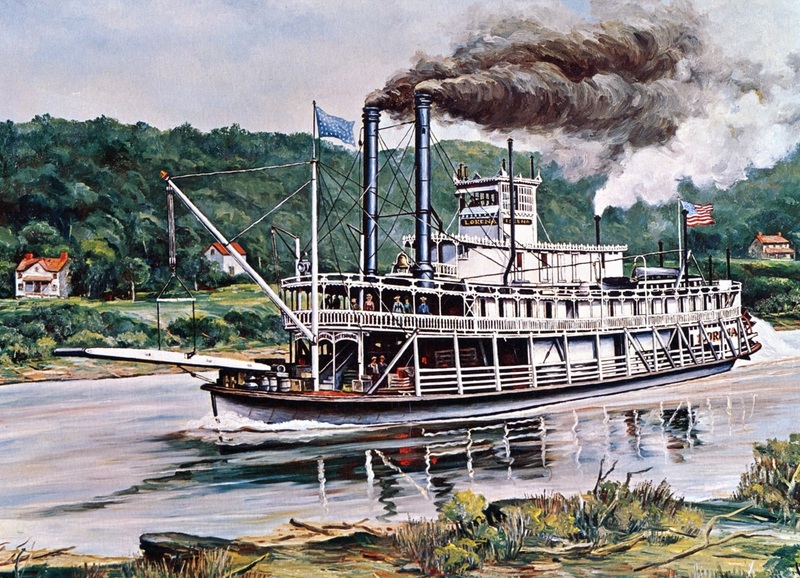 Original oil of the KANAWHA painted by William E. Reed was commissioned by S. Durward Hoag and is exhibited at the Motor Hotel Lafayette, Marietta. "The sad accident which terminated this packet's career overshadows her lengthy career of almost perfect operation, 20 years. 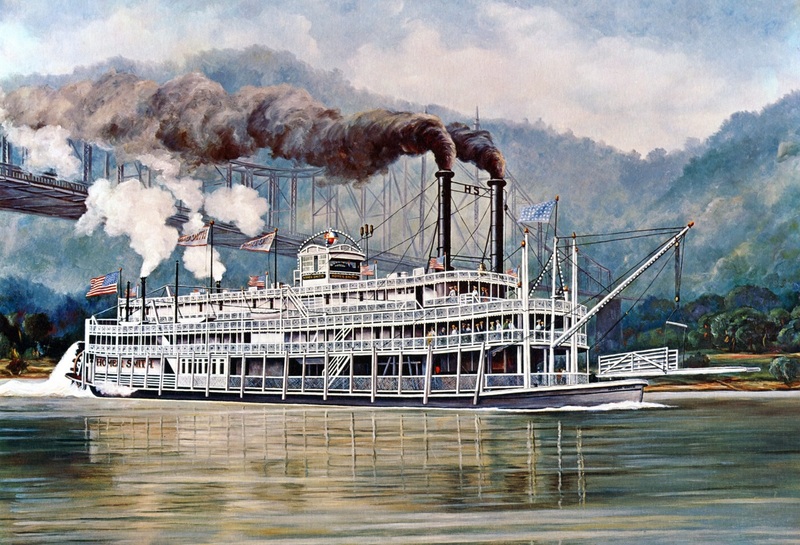 The KANAWHA was built in 1896 for the Pittsburgh-Charleston trade via the Ohio and Kanawha rivers. Most of the time her owners and many of the crew were residents of Marietta and Williamstown, so she was sort of the 'home town boat' of the area. On the blustery night of January 5, 1916 she landed at Little Hocking, Ohio to put off two barrels of oil. In turning around to resume her downriver trip the wooden hull collided with a steel tower at Lock 19, ripped a big hole, and she turned over. Many of the crew and some passengers rode the bottom-side-up hull before being rescued. Ten lives were lost." A landing left and right. Built in 1897 she survived until an electric interurban line connecting the two towns put her out of business." 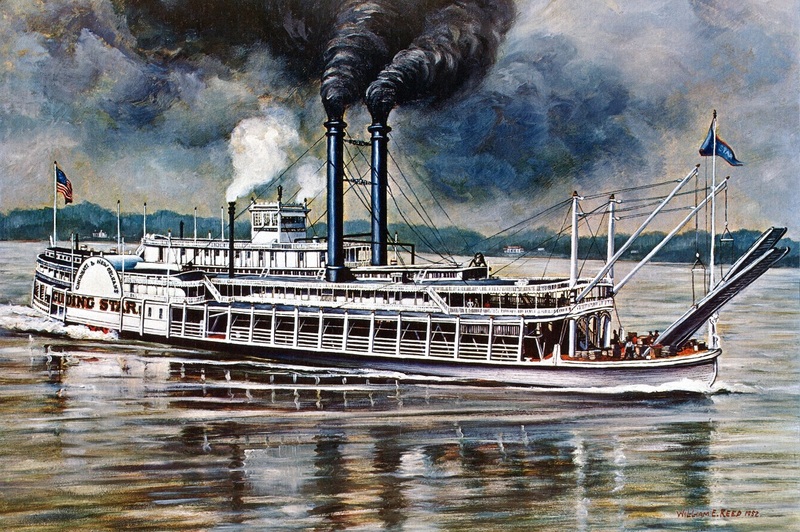 "This popular excursion boat, owned and operated by the Streckfus Line of St. Louis, was well known along the Upper Mississippi when she made her debut in 1921 Later her operations were focused in the Ohio River Built with a wood hull and wooden superstructure, she contained an enormous dancehall on the second deck running her full length. She tramped from town to town taking out matinees and moonlights. Music was provided by a full band trained in New Orleans jazz. At night she was illuminated with hundreds of lights and looked like a floating birthday cake. She ultimately became a casualty of World War II, retired because of the scarcity of crew and fuel." HOMER SMITH painted by William E. Reed Original oil owned by Robert L. Stone, Pittsburgh. "This large excursion boat (hull was 235 feet long) was built in 1914 by a group of citizens living in Point Pleasant, West Virginia and was named for Capt. Homer Smith, her manager. She was best known to Ohio Valley folks but twice in 1916 made trips through to New Orleans with passengers and freight. Pittsburgh was the base for most of her operations in summer months, and in spring and fall she toured. The original owners sold her to Pittsburghers who renamed her GREATER PITTSBURGH and in 1929 she participated in the grand Pittsburgh-Cairo celebration for the completion of the Ohio River's locks and dams. In early 1931 she burned while laid up in Pittsburgh's Manchester district." 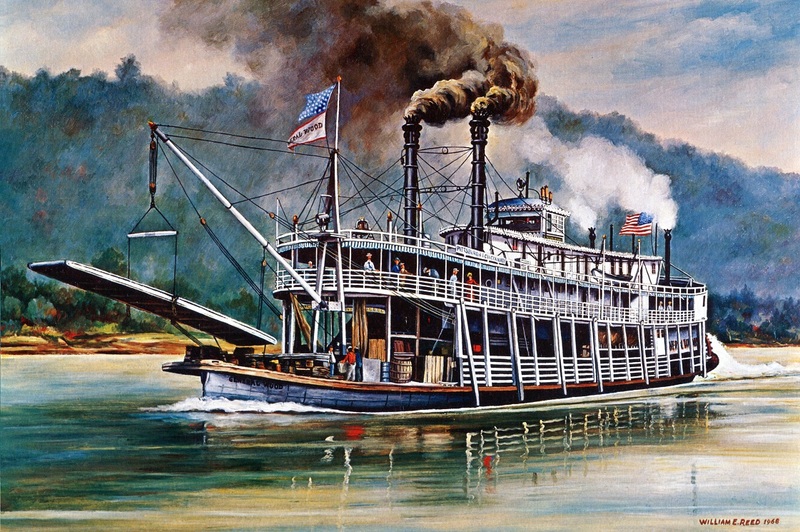 Original oil painting of the LORENA by William E. Reed was commissionedby S. Durward Hoag and is exhibited at the Motor Hotel Lafayette, Marietta, Ohio. 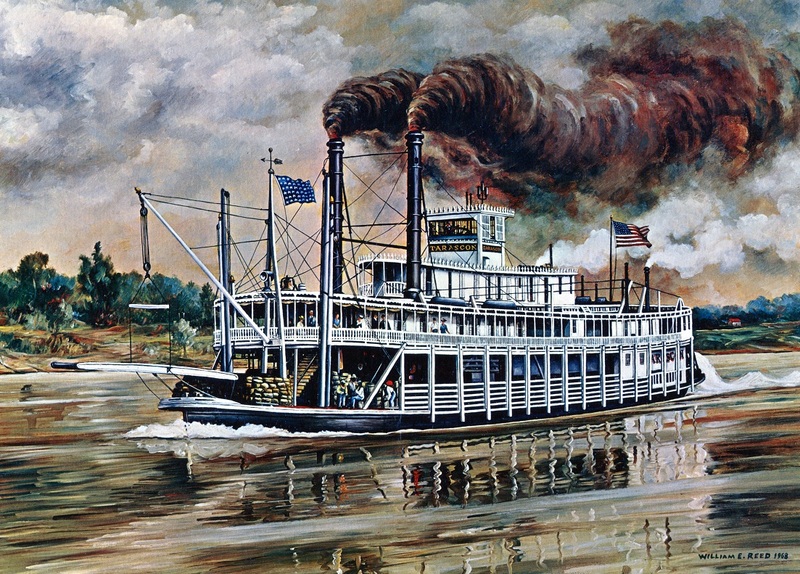 "The LORENA was named for a popular Civil War song which recently has been revived. Burl Ives and Johnny Cash have been singing it for TV audiences. (The applause has shaken the rafters). 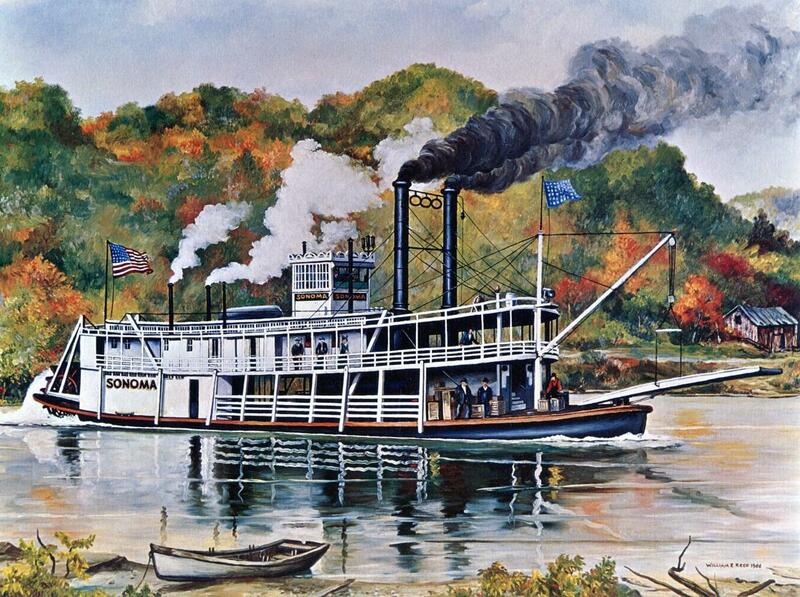 This steamboat LORENA was built in 1895 for the Pittsburgh-Zanesville trade by way of the Ohio and Muskingum. The name had special significance inasmuch as the real-life Lorena (Ella Blocksom) grew up in Zanesville. The super flood of March, 1913 wrecked the canals and locks along the Muskingum and ended the LORENA's trade there. She burned at Point Pleasant, West Virginia while undergoing repairs there in February, 1916." "This animated scene is in the Monongahela River, looking up from the Point (off to the left) toward the Smithfield Street bridge (extreme right). The barges are laden with coal awaiting a freshet to float them out to Cincinnati, Memphis and New Orleans. The many towboats which guided the barges are lying in wait, and here we see the PACIFIC NO. 2, TOM DODSWORTH, IRON AGE and others. The COAL CITY in the foreground is "making up" a tow for departure. The sidewheeler CITY OF PITTSBURGH (right in midstream) is departing for Louisville. The skyline of Pittsburgh is almost unrecognizable to moderns acquainted with the massive renaissance accomplished since 1932." 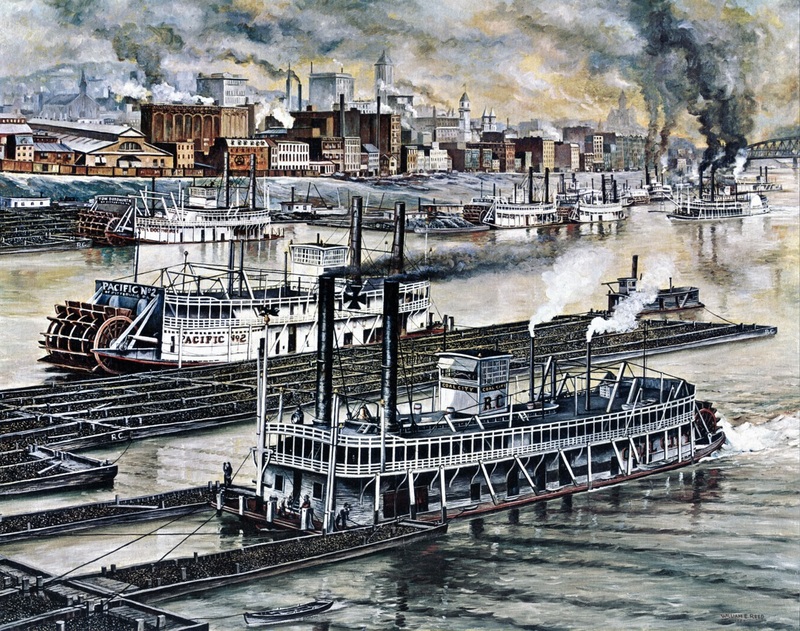 Editor's Note: the Steamboats.com Online Museum has photos and waybills for many of the boats William E. Reed painted.